Oahu is the ultimate destination for your romantic getaway! With gorgeous views and tons of unique and exciting activities and attractions, the two of you are in for the time of your lives! Here are 5 of the best things to do in Oahu that you and your sweetheart are sure to enjoy. Whether you and your other half are an adventurous pair or just want to try something new and exciting, CLIMB Works is the place to go! 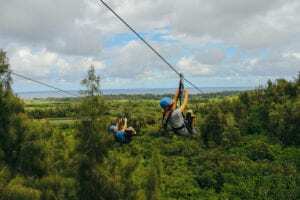 There are so many reasons why ziplining in Oahu is the perfect date! You and your special someone will have an unforgettable time as you zip side by side riding past farms, through the jungle, and up the mountainside. There are even rappels, sky bridges, and scenic boardwalks along the way. The Diamond Head Trail is one of the most popular hikes in Oahu and a great activity for couples who love the outdoors. This scenic trail is 2.9 kilometers and considered moderate in difficulty. It starts from the middle of the Diamond Head volcanic crater and climbs to the top of the rim. There, you’ll find bunkers from WWII and panoramic views of the island. You and your sweetheart can see Hawaiian green sea turtles in their natural habitat on Oahu’s beautiful North Shore when you book an Oahu Turtle Eco Adventure. This amazing tour includes turtle viewing, an hour of snorkeling on North Shore, and various stops at popular attractions on your way there. Your guide will also be talking about the history and culture of the area throughout the tour and answering any questions you might have. As one of Oahu’s most popular visitor attractions, the Dole Plantation is an absolute must! You and your sweetheart can explore 8 different gardens where you’ll get an up-close view of tropical plants. The two of you can also wander through a maze made of colorful island flora that stretches over 3 acres. Then, hop aboard the train for 2 miles and 20 minutes of beautiful scenery and narration about the story of the pineapple in Hawaii. Afterward, you can grab a delicious bite to eat and satisfy your sweet tooth with their world-famous Dole Whip! Enjoy an immersive cultural experience when you visit 6 different island villages. Once you’re done enjoying the cultural presentations and immersive activities, you can treat yourself to a delicious buffet at an authentic Polynesian luau and watch the Ha: Breath of Life evening show! When you take advantage of our packages, you can visit CLIMB Works in the morning and the Polynesian Center in the evening. The best part is that by pairing these top 2 attractions, you save anywhere from $20 to $40 per person. Now that you know all the best things to do in Oahu for couples, it’s time to start planning your getaway! Click here to book your ziplining tour at CLIMB Works today and get excited about your next big adventure together!